eBay’s new fee structure charges a flat percentage for all auction styles (auction/buy it now) and all categories (except for eBay Store subscribers), which is why there is no need to select a specific auction style or category. 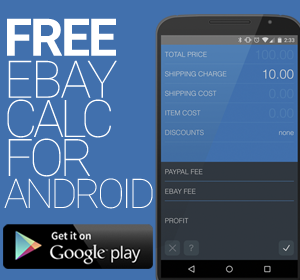 Download our Final Fee Calculator Android App! © 2019 eBay PayPal Fee Calculator. All rights reserved. UK Users, try our UK eBay Calculator here.